Villa Lucignano is reached by a typical road through the hills. 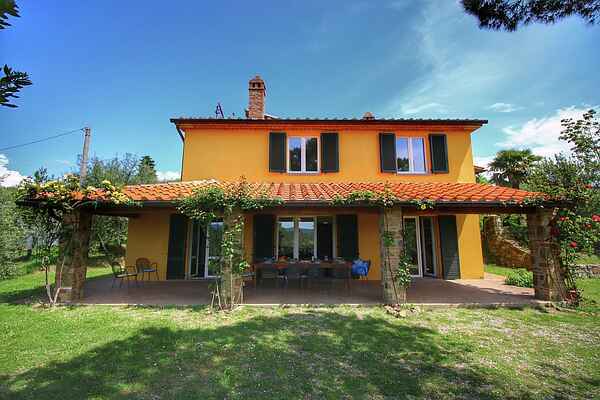 The villa is located between the Valdichiana Aretina and the hills of Siena. The villa is on a hill and has picturesque views over the olive groves and ancient forests. In the large garden of the villa is the private pool with sun loungers, umbrellas and an outdoor shower. The villa has been recently renovated to provide guests with a pleasant and comfortable stay. During the renovation, the owner looked for environmentally friendly solutions. The villa is equipped with a roof that retains heat in the winter and in the summer keeps the house cool and there are solar panels for hot water and electricity. It is an ideal place to spend a relaxing holiday in the countryside and an ideal base for cultural and tourist excursions. Lucignano is just 2 km away from the villa. It is a beautiful, walled medieval village perched on a hill. All streets and typical squares are worth a visit and a photo. Go eat some good food in one of the best restaurant in Lucignano: L'Oste Matto. The small museum in Lucignano is worth a gold tree, a Byzantine piece of the Middle Ages.